Validating your email address and specifying your notification preferences (if you are an account administrator). Notifications are used to inform account administrators that a credit quota threshold for a resource monitor has been reached. For more details, see Working with Resource Monitors. 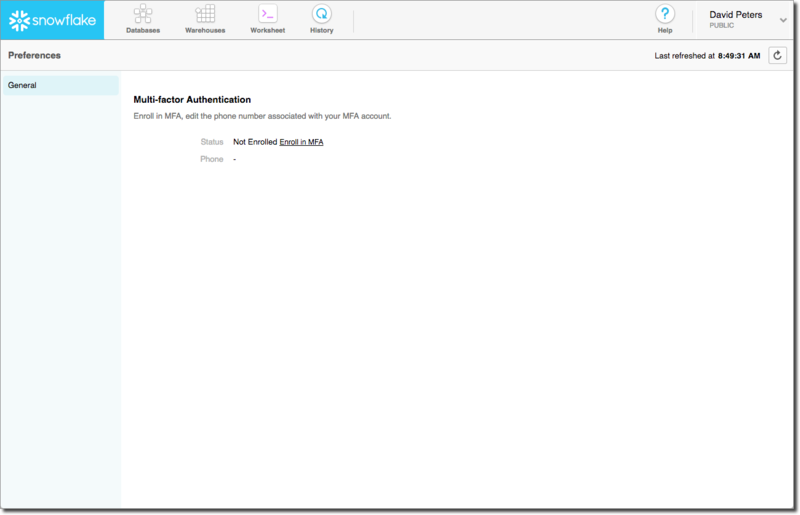 MFA is a built-in Snowflake feature (available for all Snowflake Editions) that provides an additional level of user login security by requiring a second form of authentication (in addition to your standard credentials) to log into Snowflake. This second form of authentication is provided by the Duo Mobile application, which you must install on a smart phone or similar device. By default, MFA is not enabled for individual Snowflake users. If you wish to use MFA for more secure login, you must enroll using the Snowflake web interface. Click the Enroll in MFA link and follow the instructions provided in the wizard. Enrollment requires a smart phone with a valid phone number and the Duo Mobile application installed. Once enrolled, each time you attempt to log into Snowflake, either through the web interface or a command line client (e.g. SnowSQL), you will be prompted to enter your required user credentials (login name and password) and then you will need to provide the temporary authentication token/passcode generated by the Duo Mobile application. For more information, see Multi-Factor Authentication (MFA). If you are unable to log into Snowflake due to an MFA issue (e.g. you don’t have access to your phone), please contact one of your account administrators. They can temporarily disable MFA, so that you can log in, or they can disable MFA for you, which effectively cancels your enrollment. Change the phone number associated with your user preferences because you changed your phone number or purchased a new phone.